SINGAPORE - Incoming Minister of Transport Khaw Boon Wan made his first of many visits to SBS Transit and SMRT on Wednesday (Sept 30). 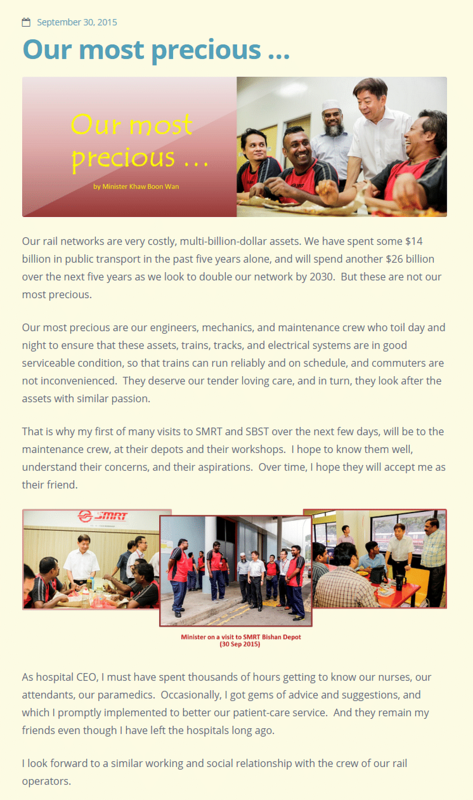 Mr Khaw, who is the outgoing Minister of National Development, wrote in a blog post on Wednesday: "My first of many visits to SMRT and SBST over the next few days, will be to the maintenance crew, at their depots and their workshops. "I hope to know them well, understand their concerns, and their aspirations. Over time, I hope they will accept me as their friend." Mr Khaw will take up the Transport portfolio tomorrow (Oct 1) when the new Cabinet will be sworn in.